Find Kiawah Island, SC Homes for sale. View Photos, Maps and MLS Data Now! Purchase of a Governors Club membership allows for access to the Night Heron water slides/poolside bar & grill. Sold furnished. MLS#19011532. Pam Harrington Exclusives. At closing, buyer is to pay .5 of 1% of the sales price to KICA as a onetime contribution to the capital reserve fund. MLS#19011574. Akers Ellis Real Estate Llc. Egret Pintail - French doors that open onto the pool deck and windowed walls bring the beauty of the outdoors in. MLS#19011353. Akers Ellis Real Estate Llc. This house is in an ideal location, near the Sandcastle, the Sanctuary Hotel, Freshfields Village, Beaches, Tennis, Golf and all the amenities of Kiawah Island.The open floor plan welcomes you into a spacious great-room with a fire place, stunning kitchen with high-end stainless-steel appliances, marble counters, wet bar, and plenty of room for your family and friends. The great room MLS#19011343. Nv Realty Group. Sold furnished with a few exclusions. Two parking spaces. MLS#19011231. Pam Harrington Exclusives. Step into the sunroom, and feel the outdoors inside, with tile flooring and windows to view the nature just outside. The entertainment room has built MLS#19011275. Akers Ellis Real Estate Llc. Egret Pintail - SOCIAL MEMBERSHIP to KI Club available. MLS#19011290. Nv Realty Group. ***********This property has a GUEST HOUSE WITH PRIVATE FULL BATH AND WET BAR/ KITCHENETTE AREA! MLS#19011133. Atlantic Edge Real Estate. Spacious porches are staples for Southern living, and this home has stunning dual porches. The MLS#19010948. Akers Ellis Real Estate Llc. Sandcastle amenities are included and a Governors Club Membership is available. MLS#19010777. Nv Realty Group. Master bedroom is located on the first floor with fireplace and access to private sunning deck overlooking tranquil lagoon. Two additional MLS#19010691. Pam Harrington Exclusives. Built in 2011, mahogany front door welcomes you to this luxury home. MLS#19010541. Daniel Ravenel Sotheby'S International Realty. The FROG will easily convert to a 4th bedroom / mother-in-law suite / bonus room / man cave. MLS#19010300. Pam Harrington Exclusives. Offering the perfect retreat, complete with a Private Deepwater Dock with 40' floater (in permitting process); an additional Boat Slip; along with access to the nearby community boat ramp, its views extend over Bass Creek, the Stono River, Kiawah River, and Folly Beach inlet out into the Atlantic Ocean. Situated behind the MLS#19009732. Coldwell Banker Residential Brokerage. A separate dining area with iron chandelier is open to the sunroom with octagonal wall of windows looking out onto a park-like setting and access to rear MLS#19009510. Pam Harrington Exclusives. 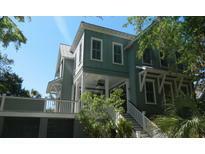 This marshfront, river view home is located in the West Beach area of Kiawah, where a MLS#19009397. Akers Ellis Real Estate Llc. Unique and utilitarian, you will find 3 private screened balconies off of upstairs bedrooms, and 2 back decks on either side of a large screened porch. MLS#19009220. Nv Realty Group. The living room has a warming gas fireplace with elevated beamed ceilings and large windows throughout that allow natural light. MLS#19009121. Highgarden Real Estate. A Kiawah Island Club Social Membership opportunity is available with this property. MLS#19008903. Akers Ellis Real Estate Llc. Kiawah Club Membership opportunity available. This home works well (cont) MLS#19008933. Pam Harrington Exclusives. The custom kitchen cabinets are complemented by the tile backsplash and highlighted by a distressed copper range hood. MLS#19008078. Akers Ellis Real Estate Llc. The exterior boasts natural tones and hues, a standing seam copper roof, flower-filled window boxes, and MLS#19008071. Akers Ellis Real Estate Llc. The spacious kitchen and breakfast room features cherry cabinetry, granite counters, top shelf appliances, a large center island with bar stool MLS#19008158. Akers Ellis Real Estate Llc. The first level floor plan offers a grand Club Room which is perfect for family gatherings and is beautifully designed with a coffered ceiling, triple crown moldings and custom pecan millwork. MLS#19007943. Daniel Ravenel Sotheby'S International Realty. Family and guests will enjoy gathering around the keeping room with it's cozy fireplace and views during meal MLS#19007219. Pam Harrington Exclusives.